Durango Martial Arts offers classes for students of any skill level. Whether you’re a beginner, expert, child, or adult, we offer a class that is right for you. We can loan you all the equipment needed for your first class. Buy gloves, kimonos, kickboxing shorts and everything else you will need at our fully stocked pro shop. Drop in today and try your first class free. Brazilian Jiu-Jitsu (or BJJ) is an art form perfected and developed by the famous Gracie family over the past 100 years. BJJ focuses on grappling instead of striking. Participants use choke holds, joint locks, leverage, and positioning to subdue and control opponents. This form of martial art has gained popularity in recent years as one of the most used and preferred styles by Mixed Martial Arts (MMA) fighters in the Ultimate Fighting Championships (UFC). BJJ is very technical, challenging, and fun! Whether you looking for a new hobby, a form of self-defense, a way to get in shape, or are interested in competition, BJJ is a rewarding activity to add into your life. BJJ Fundamentals- This class is designed for beginner students. Learn the basic positions, escapes, throws, chokes, and locks before moving on to more advanced classes. Students will build up their conditioning, flexibility, and technique while working at their own pace. Emphasis is put on drilling and learning. Live grappling is minimal. A BJJ kimono is required and can be rented or purchased. 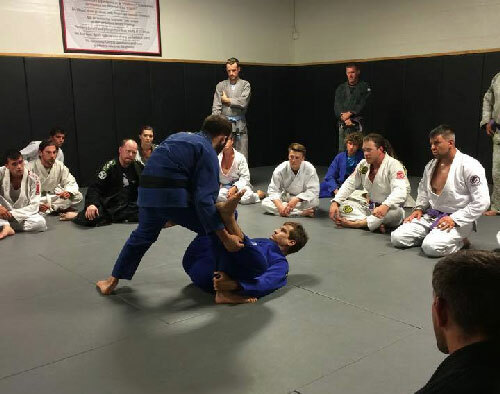 All Level BJJ- Open to students of all skill levels, this class has a focus on intermediate and advanced techniques. Previous experience and a good level of fitness is recommended. Expect to spend a big portion of the class grappling live with fellow classmates. No-Gi Grappling- Students practice BJJ techniques without the traditional kimono. This is an essential skill for those interested in competing in MMA. A focus is put on takedowns and lots of live grappling. Comfort with grappling and good conditioning will be needed. Judo- Where Brazilian Jiu-Jitsu focuses on working from the ground, Judo focuses on working from the feet. Learn trips, throws, foot sweeps, and the art of taking a person down. A Judo or BJJ kimono is required. No experience necessary. If you’re looking for a high intensity workout these classes are for you. Muay Thai is also known as the art of eight limbs and incorporates punches, kicks, knees, elbows, and clinch throws. Muay Thai has been around for hundreds of years. It is the national sport of Thailand and is also an effective form of self-defense. Our classes have an emphasis on conditioning and technique and provide an excellent way to lose weight while gaining strength, endurance, flexibility, coordination, and better balance. Kickboxing- Practice and perfect your punches, kicks, knees, and elbows using a variety of drills, punching bags, and focus mitts. This class is a great place to start if you have no previous martial arts experience and you are looking for a hard workout while also learning effective techniques that can be used in self defense or competition. Boxing gloves are required and it’s recommend students use handwraps. Durango Martial Arts Academy has women’s classes to help you reach your goals whether it’s to get in shape, learn self-defense, or train for competition. Our women’s program allows you to ease into martial arts while delivering a challenging workout that will push you to your limits. No matter how fit you are in these classes will build strength, cardio, increase flexibility, and improve coordination. Women’s Muay Thai Kickboxing- Learn the basics of kickboxing in a fun and supportive environment. Punch and kick pads or bags, use body weight exercises to get into shape, improve skills, and relieve stress. Boxing gloves are required and hand wraps are recommended. Women’s Brazilian Jiu-Jitsu- Our women’s BJJ class provides effective self-defense and an intense workout. Learn techniques that have a proven record of effectiveness and can help you feel more confident. A BJJ kimono is required. Our teen program teaches students how to defend themselves while also emphasizing hard work, self-control, discipline, and respect. We combine martial arts technique, physical conditioning, and mentor-ship to get students into shape plus build confidence. We teach students when it’s appropriate to use their training, how to avoid fights, and how to deal with bullying – including defusing a situation and standing up for themselves. Teen Brazilian Jiu-Jitsu- This class is fast paced and consists of calisthenics, grappling drills, practicing new techniques, and live grappling. BJJ is very effective for defending oneself against bullies in a school setting as it doesn’t require striking the opponent in order to win. A BJJ kimono is required and can be rented or purchased at our pro shop. Teen Kickboxing- We teach students to throw punches, kicks, knees, and elbows, along with offense, defense, and footwork. Training consists of hitting bags, body weight exercise, and light sparring. Students will need boxing gloves, shin pads, handwraps, groin protection and a mouth guard. Headgear is recommended but not required. All equipment needed can be purchased in the DMAA pro-shop. *If a student uses their training inappropriately, they will not be allowed to continue training at DMAA. The DMAA kids program is a great way to introduce your child to the world of martial arts. We use Brazilian Jiu Jitsu to help children find their own inner strength, teach the value of hard work, develop focus, and instill discipline. These classes help build confidence as kids meet and overcome challenges, gain new belt ranks, and make new friends. Our Kids Classes are closely supervised and children learn to practice grappling in a caring safe environment. Junior BJJ(ages 4-6)- Your child will learn the building blocks of BJJ using drills, tumbling, basic techniques, and a variety of games. This class is fun and fast paced. It is a great way to help your child learn how to use their body while also learning valuable life skills. Kids BJJ(ages 7-11)- BJJ is a great way for kids to direct their energy, satisfy their natural urge to rough house, and at the same time learn effective self-defense skills. Children will learn techniques, drill, play BJJ games, and grapple with fellow class-mates. Our kids program also teaches powerful and effective anti-bullying skills. We work on appropriate ways to stand up to bullies using both words and BJJ techniques. Mixed Martial Arts (MMA) is a blending of grappling and striking arts. Combatants utilize punches, kicks, knees, elbows, takedowns, strikes on the ground, and submission holds to try and subdue their opponent. MMA is one of the fastest growing sports in the world with organizations such as the UFC and Bellator bringing MMA events and fighters into the mainstream. All Level MMA- Whether you’re an aspiring MMA fighter or would like to add challenge and realism to your self-defense and grappling training, give this class a try! You will focus on learning the pillars of MMA; kickboxing, wrestling, and jiu-jitsu. You will blend these arts together while also learning ground and pound techniques, how to fight against the cage wall, and improve your conditioning. Students will need sparring gear to participate in this class such as; mouth guard, groin protection, 16oz boxing gloves, MMA gloves, shinpads, and headgear. This class will challenge your fitness and is full contact!